The two outsourcing companies paid hundreds of millions of pounds to carry out disability benefit assessments have never met contractual quality standards on the reports their staff write for the Department for Work and Pensions (DWP), they have told MPs. Capita and Atos began delivering assessments for the new personal independence payment (PIP) – which is gradually replacing working-age disability living allowance – in April 2013, but neither of them have ever met the standards laid down in their contracts for the reports produced by their assessors. 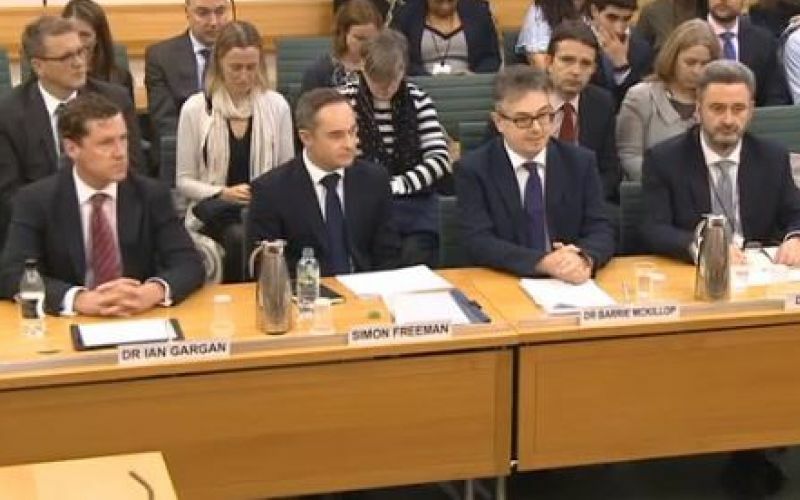 Executives from the two companies (pictured) were giving evidence to MPs on the work and pensions select committee yesterday (Wednesday) as part of its inquiry into disability benefit assessments. Atos and Capita are set to be paid more than £700 million between them over the first five years of their contracts to assess PIP claimants in England, Scotland and Wales. But the committee heard that, at one stage, 60 per cent of assessment reports being completed by Capita healthcare professionals and sent to DWP were judged to be of an “unacceptable” standard. And at one point, about 30 per cent of Atos assessment reports completed in Scotland and the north of England were being judged unacceptably poor. Currently – despite a DWP target that no more than three per cent of reports should be found “unacceptable” – nearly seven per cent of Capita reports are still being graded as unacceptable by DWP. Simon Freeman, managing director of Capita’s PIP contract, said the 60 per cent figure had been “absolutely unacceptable”, and the company had subsequently improved recruitment and training and the support it provided to assessors. But he accepted that the rate had risen again in the last few months, which again was “not acceptable”. Atos admitted that previously 30 per cent of reports had been found “unacceptable”, while its current rate was “about five or six per cent”. David Haley, chief executive of Atos’s PIP contract, said its performance at the start of the contract had been “completely unacceptable”. Both Capita and Atos said they had never met the three per cent target since they started carrying out assessments more than four years ago. Despite these repeated failings, Haley and Freeman said they had never been called in to discuss the problem with successive work and pensions secretaries. Tory MP Alex Burghart said the committee had been given “multiple examples of reports that contain basic factual inaccuracies”, and asked Capita and Atos if they were familiar with that kind of “mistake”. Freeman said he was aware of cases “where people have questioned the content”. Labour MP Neil Coyle asked whether fining assessors who made mistakes or omitted important information from their reports could help improve the accuracy of those assessments. Dr Barrie McKillop, clinical director for the Atos PIP contract, said in reply that all his assessors were registered with their professional regulatory bodies, and complaints about their actions were referred to those organisations if information had been “wrongly represented” in the reports. Frank Field, the Labour MP who chairs the committee, asked him how many assessors lose their status as healthcare professionals with these regulatory bodies “because their work is just so hopeless”. But neither McKillop nor his Capita colleagues were able to tell the committee how often regulatory bodies had sanctioned their healthcare professionals, but promised to provide that information in writing. Disability News Service (DNS) has heard repeatedly from disabled claimants angry at the failure of those regulatory bodies – particularly the Nursing and Midwifery Council and the Health and Care Professions Council – to act when presented with evidence of dishonest assessment reports by Capita and Atos staff. Field said at the end of their evidence that he had found the session “distressing”. DNS has been carrying out a year-long investigation into claims of dishonesty at the heart of the PIP assessment system, and revealed in October that complaints about the process rose by nearly 900 per cent last year. In the 12 months since its investigation began, DNS has heard from more than 250 PIP claimants who say their assessment reports were dishonest. The committee’s inquiry has produced more online evidence from the public than any other investigation ever held by a House of Commons select committee, with more than 3,200 pieces of written evidence in total. The committee was also told that both Atos and Capita employed only two doctors each within their PIP operations, with their assessments instead carried out by nurses, paramedics, physiotherapists and occupational therapists. The committee later heard from executives from Maximus, which carries out the work capability assessment (WCA) on behalf of DWP. They also admitted that they had never met their target for producing assessment reports of an acceptable standard, in the two-and-a-half years since taking over the WCA contract from Atos. The latest figures show that more than seven per cent of all Maximus assessment reports are judged to be of an unacceptable standard, the committee heard, against a target of five per cent. Leslie Wolfe, general manager for Maximus in the UK, said it was “not acceptable” that the company had never met the government’s target. Dr Paul Williams, the WCA programme director for Maximus, said the company was due to carry out about one million WCAs this year, but would only perform about 8,000 to 9,000 home assessments. Labour MP Ruth George told him and Wolfe that one of her constituents had been denied a home assessment, despite sending a letter from his GP telling Maximus that he had a fractured vertebra, and so should not be forced to attend an assessment centre. Williams told George that he would be “really quite cross” if he heard that his staff had refused to carry out a home assessment in such circumstances. George said she had been forced to intervene on Monday to prevent her constituent having to attend the assessment centre. Williams claimed that only six ESA claimants in every 1,000 lodge complaints with Maximus, and only about three of those relate to the assessments themselves.